In this paper, Ram Nidumolu, CEO of Innovastrat, USA, and Professor Sanjay Kallapur of the Indian School of Business, argue it is possible to treat CSR strategically while also complying with the new CSR provisions in the Indian Companies Act 2013. Without this strategic approach, CSR becomes only a compliance activity that may end up achieving neither corporate nor social purpose. They go on to suggest a new Responsible Business (RB) Framework, which if implemented properly, can enable companies to turn the new clause in the Indian Companies Act 2013, mandating them to spend at least 2 percent of the average net profi ts of the previous three years, into a driver for extraordinary business in India. The Companies Act of 2013 thrusts the Indian corporate world into the limelight of global Corporate Social Responsibility (CSR): its Section 135 mandates that every Indian company meeting certain size thresholds should spend at least 2 percent of the average net profits of the previous three years on CSR activities, or explain why it has not done so. In addition, such companies are required to create a CSR Committee of the Board to formulate and monitor a CSR policy, and to report on CSR. While the Act does not define CSR, it restricts the company’s CSR activities to certain focus areas listed in its Schedule VII (that include social — poverty reduction, health, women’s empowerment, and education; cultural — sports, arts, and heritage; and environmental and natural resource preservation activities), and prohibits companies from including in CSR, those activities that would be undertaken in the normal course of business. Commentators have questioned whether the new law promotes CSR, or corporate philanthropy instead. We argue in this article that it is possible to treat CSR strategically and comply with the CSR law. Without this strategic approach, CSR becomes only a compliance activity that may end up achieving neither corporate nor social purpose. CSR and “corporate sustainability” have become essentially interchangeable terms, as the following definitions illustrate. Although the roots of CSR were in philanthropy, the EC, UNIDO and other recent definitions of CSR introduce a strategic business component, where the business also benefits financially from exercising its social and environmental responsibilities. The Indian Companies Act 2013 does not define CSR but it restricts companies CSR activities to certain focus areas listed in its Schedule VII and prohibits companies from including in CSR those activities that would be undertaken in the normal course of business. In effect, definitions of both CSR and corporate sustainability require companies to think and act strategically about their future by focusing on longterm business performance. Critics of the CSR provisions in Indian Companies Act 2013 (CSR Act), however, contend that contrary to modern definitions of CSR and corporate sustainability, the permitted activities listed in Schedule VII of the Companies Act are primarily philanthropic. Moreover, they argue, considerations of business performance in formulating CSR policies would fall afoul of Section 135 because activities that benefit shareholders by improving business performance would risk being considered as “normal business activities.” We believe this view is mistaken. The first reason for our belief is that the shift from selfless interests to shared interests reflected in definitions of CSR/sustainability has occurred for several good reasons. CSR experience has shown that when companies act purely out of philanthropy, their level of commitment is subject to the vicissitudes of short-term profits, senior management interest, societal attention to philanthropy, and other such factors that affect the CSR’s impact negatively. When seen as a philanthropic activity, the company’s key business groups do not consider CSR as integral to their activities. Instead, CSR becomes the responsibility of a separate group that is charged with such non-core activities. As a result, CSR activities do not benefit from the constant innovation and dynamism associated with mission-critical activities. An approach narrowly focused on philanthropy would therefore not meet the larger goals of the CSR law, and therefore defeats its very purpose. The term “corporate sustainability” has come to be preferred by business enterprises to describe their social and environmental responsibilities. An approach narrowly focused on philanthropy would therefore not meet the larger goals of the CSR law, and therefore defeats its very purpose. Second, while the law states that expenditure on normal business activities do not count as CSR, it nevertheless does not exclude an activity from CSR merely because the company benefits in some way. Therefore “out-of-the-ordinary” business activities that promote the health of the overall business ecosystem (and hence the long-term health of the company) are not forbidden by the law. Examples of such activities include partnerships between the company and its stakeholders that enhance the strength of the extended business ecosystem, collaborations between companies that unlock system value that would otherwise not be available, expenditure on projects that would otherwise not have been funded because they fall beyond the time horizons or below the ROI cutoffs typically considered in decision making, investments in developing and implementing sustainable business models that go beyond the existing business model of the company, employee development for mindsets and skills needed for these sustainable business models, etc. CSR activities could therefore enhance shared interest and, in the process, also self-interest. An example of such enlightened self-interest is Coca-Cola’s investments in activities that promote “women, water and wellbeing”, all areas that are closely related to the health of the company’s business ecosystem. Although strategic in nature because they enhance the long-term competitiveness of the company, such activities have not hitherto been performed because they would not meet normal business decision making criteria. However, if over time the business case gets established for an activity that was initially out of the ordinary, then, in our view it would cease to be CSR. For example, if a company would not have invested in a renewable energy project at the outset because the benefits were not proven and hence would not meet the ROI criteria, it can do so as part of CSR. Subsequently if the returns prove to be high enough, then the case for investment can be made using normal business criteria; it would cease to be CSR at that stage. Seen from the above viewpoint, one function of CSR therefore is to become the incubator for new business activities that may subsequently become part of routine business operations and are no longer considered CSR. In effect, CSR becomes the R&D function for new business models, processes and activities that target the long-term performance of the company’s ecosystem. CSR projects that are successful in this way produce benefits all around — the original social purpose can be fulfilled in a self-sustaining manner and the company receives financial as well as reputational benefits (not to mention that the 2 percent CSR pool increases too). When seen as a philanthropic activity, the company’s key business groups do not consider CSR as integral to their activities. Instead, CSR becomes the responsibility of a separate group that is charged with such non-core activities. As a result, CSR activities do not benefit from the constant innovation and dynamism associated with mission-critical activities. Although research to date falls short of establishing a causal relationship linking CSR/corporate sustainability to business financial performance, evidence pointing in that direction has been accumulating gradually over the past two decades. The Deutsche Bank in 2012 reviewed 56 academic studies that related the financial performance of companies to their ESG (Environment, Society, and Governance) activities. It found that companies scoring high on ESG ratings were associated with a lower cost of debt and equity, and generally outperformed the market in the medium (3-5 years) and long (5-10 years) term. A study performed at the Harvard Business School comes closest to establishing a causal link between sustainability and performance. It tracked the financial performance of ninety companies that widely implemented sustainability practices, against ninety companies that did not, over the period 1993-2010. The two groups were matched in terms of size, industry and profitability as of 1993 so that differences in performance were more likely due to their adoption of sustainability practices. The study found that the high-sustainability group significantly outperformed the low-sustainability group on financial measures such as return on equity (ROE) and return on assets (ROA). For example, an investment of $1 in book value of equity in early 1993 in a value-weighted portfolio of high-sustainability firms would have increased to $31.7 by the end of 2010, while it would have increased only to $25.7 in the low-sustainability portfolio. The researchers fi nd that compared to the low-sustainability group, the high-sustainability companies were more long-term oriented, had organised processes and procedures for engaging with all their stakeholders, had incentives to compensate top executives on sustainability performance, and had boards that saw themselves as responsible for sustainability. These are therefore the likely drivers of better performance. Practitioner experience reinforces the empirical evidence that CSR/corporate sustainability enhances financial performance in a variety of ways. Sustainability also improves business performance by reducing product waste and increasing material reuse in production through recycling. Like other sustainability initiatives, such recycling programmes typically begin as exploratory efforts that are not in the regular course of business. With experience and a better understanding of ROI, they can get scaled up to produce enormous business benefits. For example, Sprint avoided over $1 billion in costs in 2001-2011 by collecting over 4,000 metric tons of electronic waste comprising over 40 million wireless devices.10 In 2010 GM recycled 92 percent of materials from its plants and achieved zero-waste status for over half of its factories.11 Another key area for business improvement is transportation & logistics. Walmart, the world’s largest retailer, expects to save an estimated $3 billion in transportation costs by reducing packaging volume by 5 percent by 2015. A key thread that connects these benefits is the greater trust in the company that sustainability engenders among its stakeholders. Greater investor trust is associated with lower cost of capital, and greater societal trust is associated with an improved corporate reputation. • Risk management: Sustainability enables better risk management by giving firms far greater visibility into potential exposures that could cause on-balance sheet risks down the road, including price volatility around energy and commodity prices; impact from more stringent regulations; supply chain disruptions or lack of access to key product development inputs; damage to reputation, brand, stock value, or license to operate; and future exposures and losses related to stranded assets. • Capital Productivity: Sustainability unlocks opportunities for greater capital productivity through reducing compliance, operating and product development costs; optimizing supply chains; boosting employee productivity; driving business processes improvement; reducing cost of capital; and opening new financing options. • Innovation and Growth: Sustainability enables business innovation and growth by creating new customer relationships; inspiring new products and business models that drive growth; anticipating future growth problems during mergers and acquisitions; and, in some pioneering companies, by creating new markets. A key thread that connects these benefits is the greater trust in the company that sustainability engenders among its stakeholders. Greater investor trust is associated with lower cost of capital, and greater societal trust is associated with an improved corporate reputation. Such reputational benefits are typically among the top reasons why companies pursue sustainability.18 Additionally, for companies such as Unilever and other global sustainability leaders, this reputation has greatly benefited talent recruitment and retention, especially of the Millennials.19 In the face of this evidence and given the severe trust deficit that many Indian businesses face, an Indian company that treats the CSR law as an opportunity for committing to corporate sustainability would benefit considerably in improved corporate reputation, employee recruitment and talent retention. If CSR is to become like an R&D function responsible for the long-term performance of the company’s ecosystem, it would help to have a strategic framework for effectively discharging this responsibility. In this section we outline such a framework. Its core elements have been used by the lead author in client engagements with Fortune 500 companies in the US. 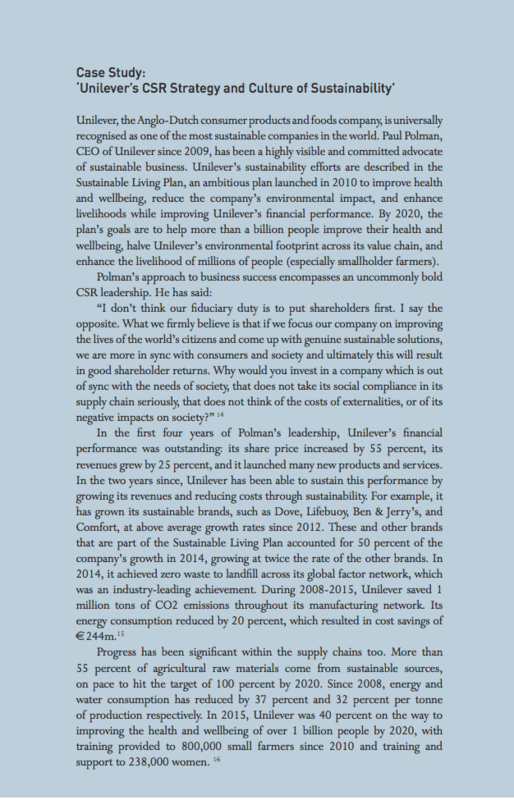 While these companies were clearly not subject to the CSR laws, their concerns were similar: How to identify and implement CSR/ sustainability initiatives that were out of the ordinary but improved the long-term performance of the company’s ecosystem (and hence the company)? Shareholders benefit from better risk management, greater productivity of capital, and stronger innovation and growth associated with a responsible and successful CSR strategy. • Local communities should benefit through the shared interests that are enabled through a responsible and successful CSR strategy While shareholders should not be the primary beneficiary, as we argue that, companies are not prohibited from choosing those among the above activities that have the greatest benefit to shareholders. As we have seen above, shareholders benefit from better risk management, greater productivity of capital, and stronger innovation and growth associated with a responsible and successful CSR strategy. The empirical research cited earlier shows how successful CSR strategies have benefited different stakeholders. An initial qualitative gap analysis can provide a high-level guide to the stakeholders whose needs are not being met and the associated CSR initiatives that are needed. If CSR/sustainability has demonstrated that it can contribute significantly to business performance while being good for society and nature, it seems perverse and eventually self-defeating not to avail of this opportunity. • The Governance Filter: identifying the governance-related impacts of business activities (and the stakeholders who are impacted) that are significant in nature. Further, the activities should be compared to areas listed in Schedule VII to see if they meet the requirements of the CSR law. Most environmental and social activities are likely to qualify, but governance activities may not unless they qualify under education (the Ministry of Corporate Affairs has clarified through General Circular 21-2014, dated June 18, 2014, that the categories mentioned in Schedule VII should be interpreted liberally — so education related to governance will count). 3. The Externality Principle: Once the key stakeholders, significant ESG impacts, and stakeholder benefits have been identified, it is important to determine which initiatives meet the not-business-as-usual requirement of the CSR law. The externality principle can help make this determination, by separating business activities that are in the normal course from those that are not. • The Lion’s Share Criterion: An initiative is outof-the-ordinary if the net benefits (including avoided costs) to stakeholders other than shareholders exceed the net benefits to the shareholders, i.e., other stakeholders get the lion’s share of the initiative’s net benefits. The strong form of the externality principle, which we recommend, would require both criteria to be met for initiatives to be considered out of the ordinary. Underlying this strong form is the belief that a CSR activity is one where greater importance is given to other stakeholders when compared to shareholders, even if the latter also benefit from the initiative. This is clearly not ordinary business practice and therefore meets the intent of the CSR law. Taken together, the three components of the RB framework described above, provide a systematic approach to identifying CSR initiatives and activities that conform to the CSR law and improve the ESG performance of the company’s ecosystem of stakeholders. The RB framework is therefore strategic because it improves the company’s long-term business performance. 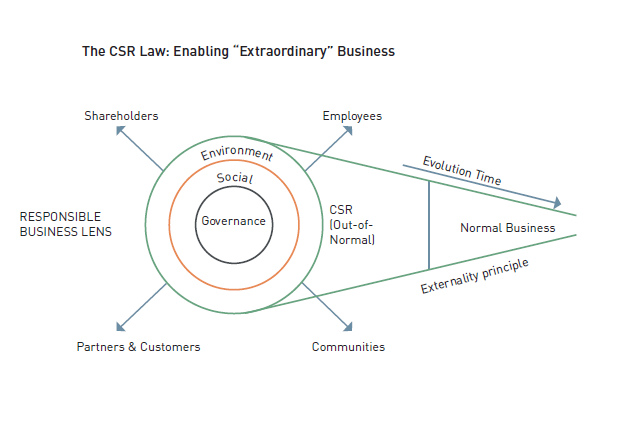 The Responsible Business framework can provide strategic guidance to C-level leadership in using the CSR law as a catalyst for disrupting business-as-usual and enabling extraordinary business. Nothing less is needed if we are to successfully sustain the ecosystem and institution of business into the next century. In conclusion, the CSR provision of the Companies Act 2013 has created major interest and controversy in the country and abroad. The chief concern is whether it perpetuates a CSR-as-philanthropy view or whether it is consistent with the modern view of CSR/sustainability as a strategic opportunity that improves business performance. In this paper, we argue that the latter view should be adopted and is indeed compatible with the spirit and letter of the CSR law. If CSR/sustainability has demonstrated that it can contribute significantly to business performance while being good for society and nature, it seems perverse and eventually selfdefeating not to avail of this opportunity. We also describe a responsible business (RB) framework that enables senior leadership to adopt and implement a strategic view of CSR that is compatible with the CSR law. We believe this framework can provide strategic guidance to C-level leadership in using the CSR law as a catalyst for disrupting business-as-usual and enabling extraordinary business. Nothing less is needed if we are to successfully sustain the ecosystem and institution of business into the next century. 6R.G. Eccles, I. Ioannou, and G. Serafeim, “The impact of a corporate culture of sustainability on corporate behavior and performance,” Harvard Business School working paper, HBS Working Knowledge, Number 12-035, November 2011, hbs.edu. 17R. Nidumolu, T. Yosie, P.J. Simmons, op cit.